Bali Bird Sanctuary – a unique community-protected, three-island sanctuary off Bali, Indonesia – provides a haven for the IUCN-listed Critically Endangered Bali starling and other endangered native birds. Indonesia has the second-highest number of threatened bird species in the world. Also known as Rothschild’s mynah, Bali mynah and Jalak Bali – this emblem bird of Bali is on the International Union for the Conservation of Nature (IUCN) Red List of Threatened Species – currently listed as Critically Endangered, and is now the second rarest bird in the world. Friends of the National Parks Foundation (FNPF) established the sanctuary on the Nusa Penida group of islands – Penida, Lembongan & Ceningan – with cooperation of local communities to save the Bali starling (Leucopsar rothschildi) poached to the brink of extinction in the wild – by decades of global trafficking. Most beautiful of the mynah family, the Bali starling is endemic to the Indonesian island of Bali and native of lowland, tropical forests. The Bali starling – pure white with sky-blue mask around both eyes, and a yellow bill – has a lifespan up to five years in the wild or up to fifteen years in captivity. The Bali starling lays turquoise eggs and hatches up to four chicks in a season. Today, the Bali Bird Sanctuary, which covers the Nusa Penida islands group, is home now to over 100 Bali starlings, successfully increasing the wild population from fewer than 10 surviving birds when the FNPF bird conservation project began in 2006. In cooperation with the three-island group’s 46 villages who enforce traditional laws that govern daily life, the Bali starling and other native birds are now protected from poachers and wildlife traders. All villages within Bali Bird Sanctuary display signs declaring involvement in the conservation project. At FNPF’s Bali starling conservation program, specialist Bird Keeper staff are breeding the Bali starling for wild release, also rehabilitation and release of other ex-captive endemic bird species – including Java sparrows and Lesser sulphur-crested cockatoos – and is a halfway house for confiscated birds from elsewhere in Indonesia, in care until safe to return to their natural habitats. Nusa Penida was declared a Marine Protected Area in 2014. FNPF is now working with regional government Klungkung Regency to declare the Bali Bird Sanctuary an officially protected zone – under judicial law – and is now attracting researchers and conservationists to the island by promoting eco-cultural tourism for the benefit of local communities. In 2014, FNPF was visited by the MV National Geographic Orion with 85 Durrell Wildlife Conservation Trust (UK) philanthropists and lecturers on board – to witness a return to the wild of Bali starlings at a traditional Balinese Hindu temple ceremony – during a ‘Critical Species and Islands-at-Risk’ expedition through Borneo, Bali and Komodo. Bali starlings are traditionally released to the wild at temple ceremonies. 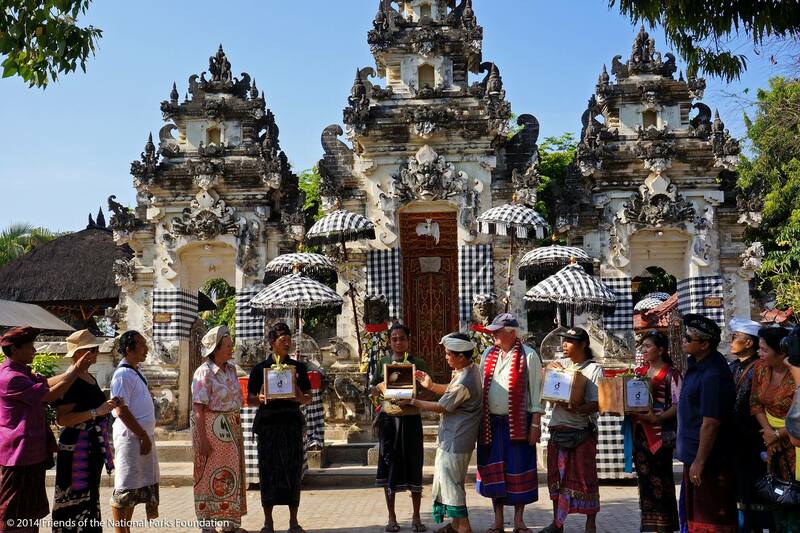 In preparation for a bird release ceremony, the FNPF Bird Keeper travels to each temple around the island collecting holy water which is used to bless each Bali starling and spiritually binds the community to the birds – ensuring obligatory social and moral protection under traditional law. On release day, a priest conducts ceremonial prayer and blessings before the birds fly to freedom at local temples. FNPF Nest boxes are placed high in temple trees to ensure the birds are provided added security in the temple grounds. Reforestation – a key conservation activity on Nusa Penida – is supported from the FNPF tree nursery, run by staff and volunteers. Together with local people, the island’s forests are regenerated in the wet season by replanting tens of thousands of native tree saplings each year. FNPF staff and volunteers monitor every sapling planted for three years to ensure a minimum 70% survival rate. The reforested native trees, of ten or more different species, provides food and shelter for birdlife – including Bali starlings – reduces soil erosion, increases rainfall and provides economic benefits to the community. The Bali Bird Sanctuary, Nusa Penida, is a member of the Wildlife Land Trust’s network of sanctuaries. Established by Humane Society International (Australia), the trust protects more than 725,000 hectares of habitat worldwide, including sites in Australia, Canada, South Africa, the United States, Belize, and India. Bali Bird Sanctuary and other FNPF Nusa Penida activities are run in partnership with the local community, Indonesia’s Ministry of Forestry and local NGOs. 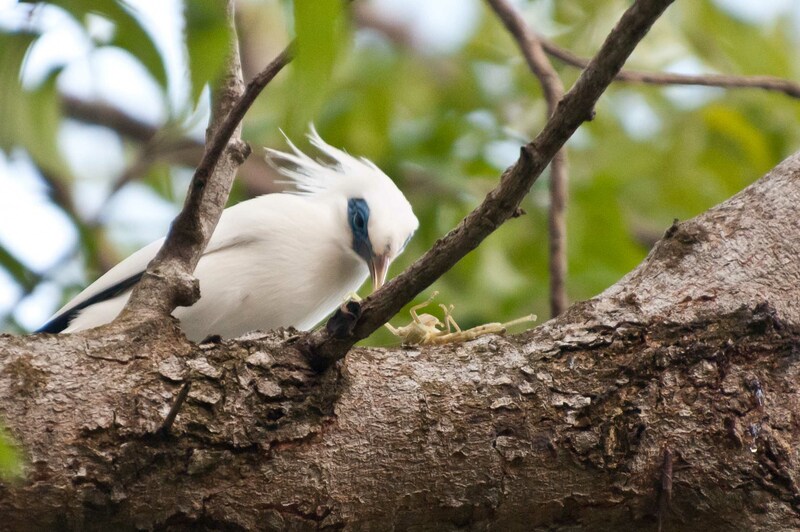 The Bali starling conservation breeding program has been recognized by Birdlife International and other interested agencies who monitor progress and success of the bird’s population. Protected in West Bali National Park – the Bali starling was reduced to less than 10 in the wild by 2005. Traded to global traffickers, the birds were poached by local villagers and organised gangs who sold the birds for large profit. Despite decades of breeding and protection programs by NGOs and the Indonesian government – the Bali starling was near extinction. In 2006-07, FNPF initially released 64 Bali starlings onto the island of Nusa Penida. By 2010, the population had increased to over 100 – a highly successful breeding program. During 2011, FNPF released another 10 Bali starlings on Nusa Penida. Staff captured photos of Bali starlings without rings (bands) on their legs feeding their chicks – meaning that the chicks were at least 3rd generation from the original birds released. By mid-2012, the population was estimated at 105 Bali Starlings and the birds had repopulated across all three islands. After release, the Bali starlings are continuously monitored by FNPF staff – recording spread and coverage, numbers, breeding cycle, choice of food and habitat. To increase genetic diversity of the Bali starling population on Nusa Penida, FNPF is collaborating with multiple Bali starling breeders to release at least 10 additional Bali starlings each year, until we are convinced that the population is viable in terms of numbers and genetic diversity. Half a dozen, captive-bred Bali starling chicks were born at the FNPF Bali starling conservation program on Nusa Penida in late 2013. Read more about the first lot of these hatchlings. The initial batch of Bali starlings rehabilitated and released by FNPF onto Nusa Penida in 2006-07 were sourced from Begawan Giri Hotel (later Begawan Foundation) – where FNPF Founder & Director Dr Bayu Wirayudha, a bird specialist, designed and managed that bird breeding program. Successfully breeding almost 100 birds – from just two pairs imported from the United Kingdom – the first release included 64 of these captive-bred Bali starlings relocated to the FNPF Bali starling conservation program on Nusa Penida. FNPF’s holistic conservation and community approach is uniquely successful as local communities also benefit from FNPF’s projects. Despite being a poor island, the communities protect the highly valuable birds from being stolen and sold.